In her book “The Hiding Place” Corrie ten Boom relates an incident that taught her always to be thankful. She and her sister Betsy had just been transferred to the worst German prison camp they had seen yet, called Ravensbruck. The barracks were extremely overcrowded and horribly flea-infested. After their scripture reading in 1st Thessalonians that morning, where the Lord reminded them to rejoice always, pray constantly, and give thanks in all circumstances. Betsy suggested they stop and thank the Lord for every detail of their new living quarters. At first, Corrie was appalled by the idea. 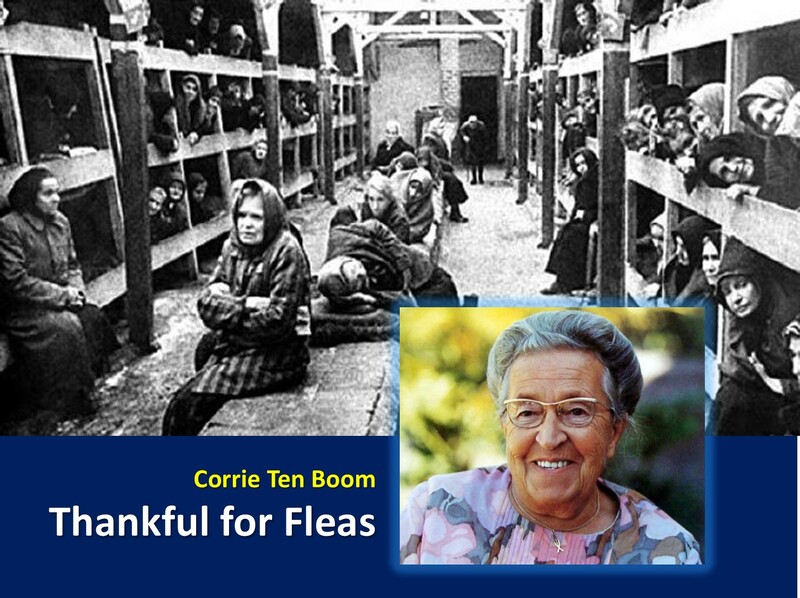 She flatly refused to give thanks for that smelly, dirty, flea-ridden place. But Betsy persisted -- and Corrie finally succumbed to her pleadings. It was by a miracle of God that Corrie and Betsy were able to smuggle their Bible into the camp. If the guards found out that the women were holding nightly Bible studies in their barracks, they surely would have been punished harshly, maybe even killed. During the months they spent at that camp, however, no guard ever said one word. It was not until several months later that they learned the reason why the guards would hardly ever come into their barracks. They wouldn't enter the barracks because of the fleas!! Perhaps you're dealing with some difficult circumstances today. But who knows? There may be a purpose beyond our understanding! Let's choose trust the Lord and maintain an attitude of thankfulness in every situation, no matter how hard it may be! Dear Lord, we want to thank You for the difficult things that are happening around us. Help us look to the good in each of them. In the Name of Jesus, Amen.